Professor John Womersley. chief executive of the Science and technology Facilities Council, told reporters at a briefing in London: “They have discovered a particle consistent with the Higgs boson. The Cern laboratory appeared to have let slip its biggest breakthrough in a generation after appearing to announce the discovery of a new particle in an online video overnight. In the short film accidentally published by the lab yesterday spokesman Joe Incandela is seen describing how physicists at the Large Hadron Collider had “observed a new particle”. Today scientists gathered in Geneva to announce the findings. Among the audience was Peter Higgs, the Edinburgh professor who first proposed the existence of the mysterious particle almost 50 years ago. Rumours had been rife that scientists hunting the Higgs were to announce today’s finding but the video appeared to confirm the finding of a particle matching its description hours before it was confirmed. Although their results are said to be strong enough to claim an official discovery, the scientists will avoid doing so because they remain unsure whether the particle they have found is indeed the Higgs. Cern spokesman James Gillies said the video was one of several filmed to cover every eventuality and did not directly relate to today’s announcement. 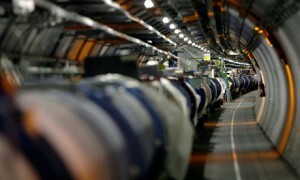 The Internet has been rife with rumours of a discovery ever since CERN, the European nuclear research facility, announced it would hold a press conference today with the leaders of its two gigantic experiments, ATLAS and CMS. Sources have told the Telegraph that ATLAS will today announce a 5-sigma signal and CMS will announce a 4.9-sigma signal of a new particle with a mass of 126.5 GigaelectronVolts (GeV) and 125.2 GeV respectively – a result which falls slap bang in the middle of the tough-to-explore region where many physicists were adamant the Higgs was hiding. The results being announced today definitively point to a new particle or particles which fit the description of a Higgs Boson, but further research will be needed to characterise it properly. To do so, scientists use the LHC to smash together protons at almost the speed of light and scour the debris for traces of particles that sprang into existence for just a fraction of a second before disintegrating. Sources have told the Telegraph that ATLAS will today announce a 5-sigma signal and CMS will announce a 4.9-sigma signal of a new particle with a mass which matches many physicists’ idea of a Higgs Boson. An ATLAS researcher said there was “no question” the two detectors are seeing the same thing, adding: “A lot of bets are going to be settled up [today]”.